Charleston’s antebellum hotel, Kings Courtyard Inn, is designed in the Greek Revival style with unusual Egyptian accents. Built in 1853, it is one of King Street’s oldest historic buildings and has served many roles in its 150-year history, from housing popular shops, to a private residence and an inn catering to plantation owners and merchants. 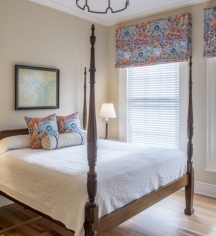 Now restored with attention to historical and architectural accuracy, each guestroom is furnished with early 19th Century reproductions, high ceilings and Oriental rugs over original hardwood floors. Some of the historic inn’s rooms circle two inner courtyards and a rear garden. 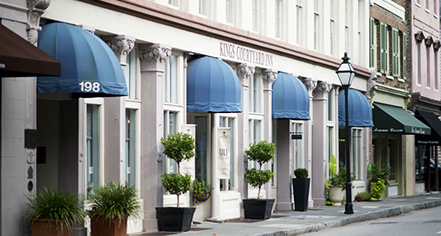 The hotel's King Street location places it within easy walking distance of Charleston’s historic homes, gardens, churches and a multitude of galleries shops, and restaurants. Kings Courtyard Inn, a charter member of Historic Hotels of America since 1989, dates back to 1853. The property is one of historic King Street’s oldest buildings and has housed shops, private residences, and an inn catering specifically to plantation owners. Adjoining Rooms: Limited availability. Please contact hotel to reserve. Airport Transportation: None is provided by the hotel. Deposit: One night deposit required at time of reservation. Extra Person Fees: $25 per night for each person over 2 guests in a room. Hotel/Resort Fees & Taxes: All reservations may be subject to a 13.5% tax. Parking: Self-parking: Available; $17 per evening, in/out privileges. Charleston’s antebellum hotel, Kings Courtyard Inn, is designed in the Greek Revival style with unusual Egyptian accents. Learn more about the History of Kings Courtyard Inn .